University of Virginia alumni Bradford and Bryan Manning – now known nationwide as “Two Blind Brothers” – have had a quite a year. This time last year, they started Two Blind Brothers, a clothing line donating all of its proceeds directly to blindness research. One year later, the brothers – who both live with a degenerative eye condition called Stargardt’s disease – have donated about $60,000 to blindness research. They have been featured in media around the world, including high-profile appearances on the “NBC Nightly News” and “The Ellen DeGeneres Show.” DeGeneres, partnering with the publishing company Shutterfly, purchased $30,000 worth of the brothers’ signature shirts. Since the two television appearances aired in January, clothing orders have roughly quadrupled. 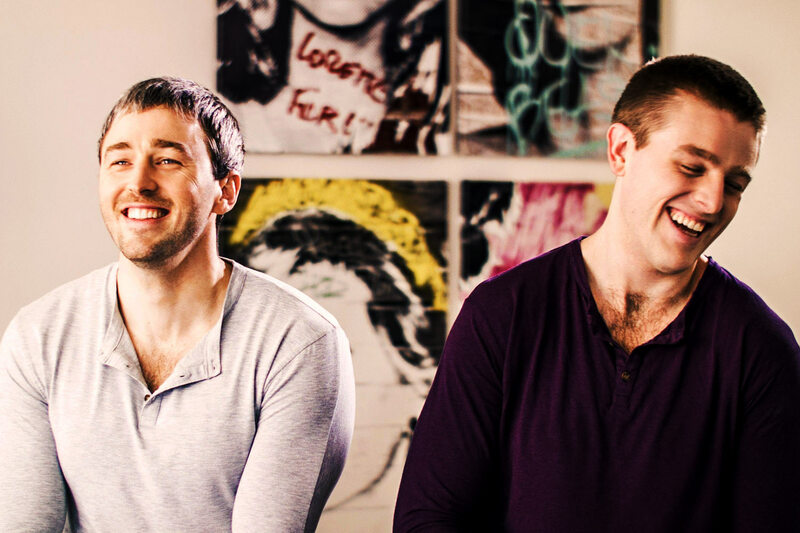 The brothers hired two employees and both quit their day jobs to run the company full-time. Last week, they launched a special 20-day “Shop Blind” campaign, blacking out their usual website and selling only two “blind” items priced at $25 and $85. All proceeds from the promotion – which ends on June 15 – will raise money to provide visually impaired children with high-tech goggles that could improve their vision. UVA Today caught up with the Mannings to find out more, take a look back at their first groundbreaking year and see what’s next. Q. You had some really high-profile exposure on “The Ellen DeGeneres Show” and NBC. What has the aftermath of those appearances been like? Bradford: We had hundreds of back orders after the shows aired, and at the time, I was full-time, while Bryan worked from 5 p.m. to midnight after his job, along with one assistant. Immediately after the ‘Ellen’ appearance, we decided to hire a few more people and essentially upgrade the business across the board, including bringing on a public relations agency willing to do pro bono work for us. Bryan: The NBC segment – which came about after a producer’s daughter and UVA alumna read our story in UVA Today – has been just as powerful as our appearance on ‘Ellen.’ It really gave us a lot of exposure. Ashton Kutcher even posted about our company after that. Q. What have been some of the challenges of scaling up to meet that demand? Bradford: For us, it’s now about taking all of those early fans and customers and creating as much of a relationship as possible. We spend some time each day getting on the phone with families that are affected by blindness or degenerative vision, just to keep building those relationships. The UVA community has also been really important, offering a web of great connections. Bryan: We want to keep building a really strong community, and we are starting to learn how we can better talk to our audience. We had to grow so quickly, so our challenge now is learning more about how to run and manage a company that is not just the two of us. There is so much exciting research going on right now, and we want to be able to support that as much as possible. Q. What are the biggest changes you have made? Bradford: One of our biggest updates is that the Dallas Lighthouse for the Blind, a great organization serving the blind and visually impaired, now does all of our cut-and-sew manufacturing. They own an apparel manufacturing facility in Dallas and reached out after hearing about us in the media. More than 70 percent of their workforce is blind or visually impaired, which makes this a great way to have our whole supply chain – from manufacture to sale – supporting people dealing with blindness. It’s been awesome. Q. What are you hoping to accomplish with your current “Shop Blind” promotion? Bryan: The main focus of the promotion is to raise money for families who could benefit from high-tech goggles and other products being tested to help children with diseases like ours. There are a lot of great products being researched, but they are still expensive. We want to help as many families as possible try them out. Bradford: It’s also a chance for us to show a little bit of what shopping – and other everyday tasks – are like when your vision is impaired. In our daily lives, Bryan and I have to trust a lot of friends – and strangers – to help us do things. We wanted to give other people that experience. Shopping “blind” can be odd and uncomfortable, but that is kind of the point. So far, people seem enthusiastic. We have gotten a lot of orders. Q. Have you tried any of the goggles in development? Bryan: Brad and I have tried most of these technologies available at this point. Because we have lived with Stargardt’s disease for so long, we have our own workarounds and tricks that work best for us. But we can definitely see how some of these technologies can work really well for people, by magnifying their center vision or moving as much of the image as possible into peripheral vision, where it is clearer. They could be especially powerful for children who are just learning to live with the disease. Bradford: What we care most about, especially with this promotion, is working directly with a family and helping them find the right option for their kids.